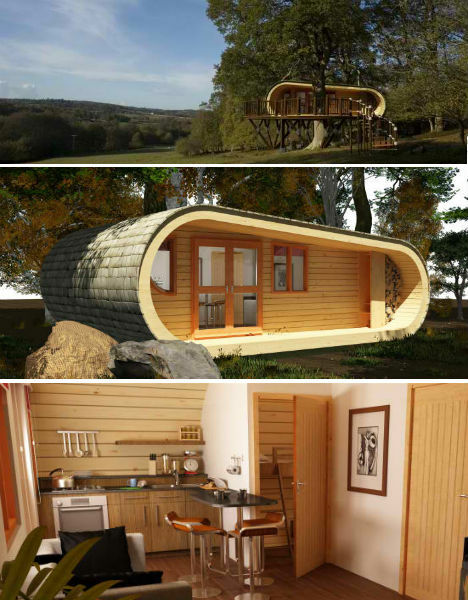 Luxurious and eco-friendly, Blue Forest‘s imaginative and playful tree houses, lodges and educational facilities seem to be designed to bring out every adult’s wide-eyed inner child. Blue Forest has designed many incredible structures that celebrate the warmth, coziness and sustainability of wood, honoring the material itself and of course, its source. Check out these 18 eye-catching, envy-inducing buildings made by the UK-based company. 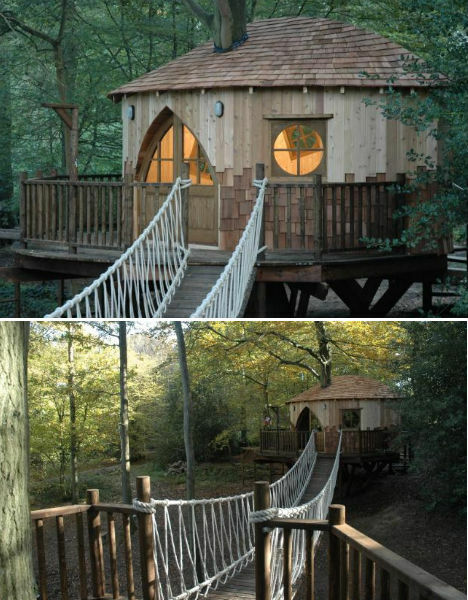 Blue Forest’s best-known treehouse is located on the grounds of the Amberley Castle Country Hotel in Scotland. It’s used as a recreational getaway space for hotel guests, and also as a multi-purpose venue for corporate entertainment, meals, weddings and private parties. 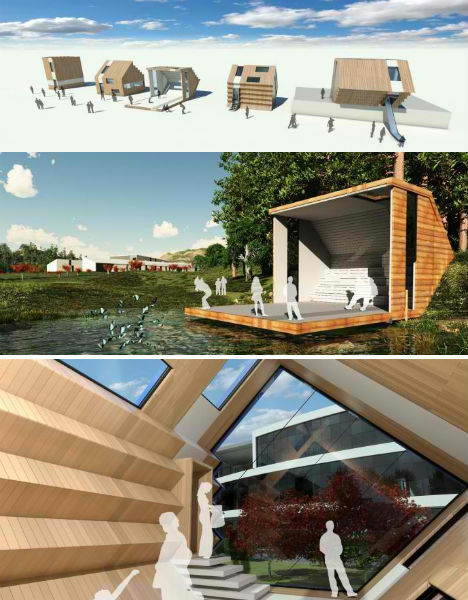 This intriguing concept design is a prefabricated, hand-crafted eco classroom that can be set onto a foundation on any of its six sides for a multitude of purposes including gallery space, nature observation and educational lectures. 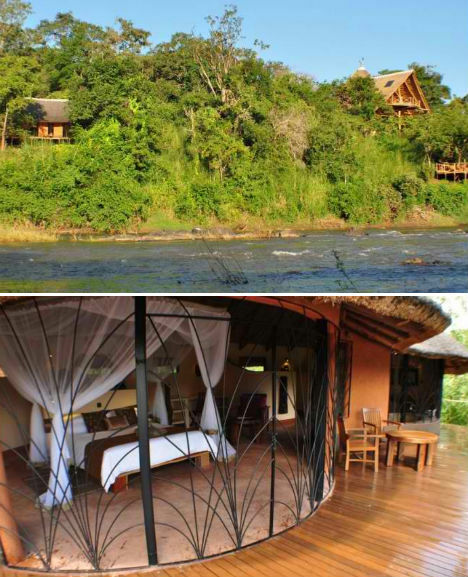 Located on the Nkhotakota Wildlife Reserve in Malawi, the Tongole Wilderness Lodge overlooks a river in one of the country’s last ‘truly unspoiled’ wildlife areas. Offered as an eco-friendly place to stay in the region, the open-air lodge was built from local materials including clay, rock, wood and thatch. 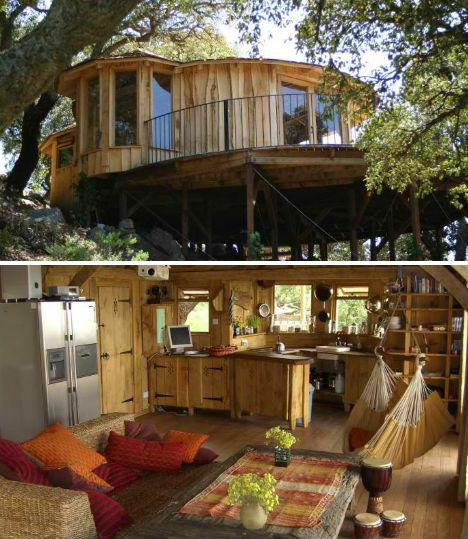 From its diminutive-looking exterior, you would never guess that this Eco Perch vacation rental can sleep four people. Inside are a full-sized bed, bunks for children, a kitchen with a dining area and a full bathroom with shower. Based on Blue Forest’s treehouses, the unit is elevated from the ground. It can be delivered, assembled and ready for decoration with five days. 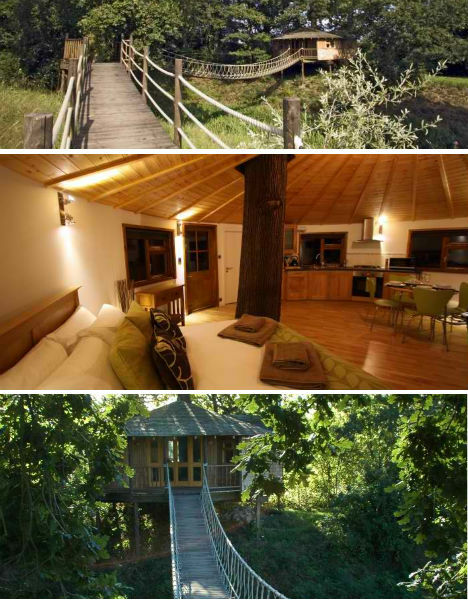 This may just be one of the most luxurious treehouse vacation rentals in the UK. 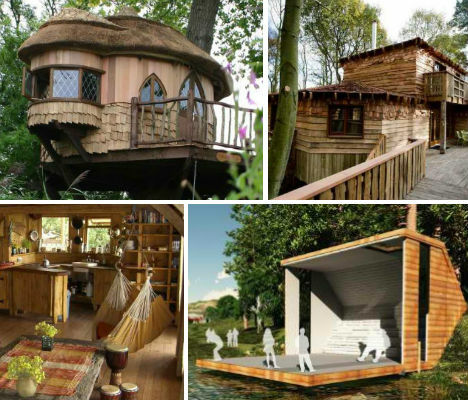 The contemporary lakeside treehouse for getaway spot Cleveley Mere can sleep up to six, with two bedrooms, a sun deck, floor-to-ceiling windows and a rope bridge. 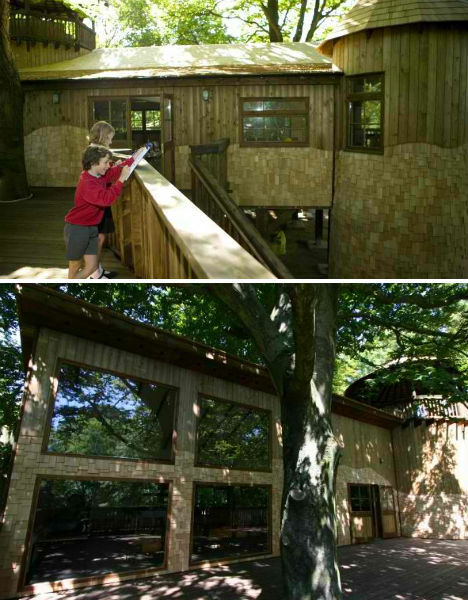 One of Blue Forest’s educational facilities, the Treehouse Study Center teaches children about nature and the woods in the center of New Forest National Park in Hampshire. It includes two treehouse classrooms, ground-based buildings containing other facilities, canopy walkways, a rope bridge, solar-powered lighting, a water catchment system and biomass energy. The organic shape and natural materials of the Tarifa Eco Lodge make it ideal for a nature-oriented getaway. Located in the hills of Andalucia on the Spanish Costa de la Luz, the Tarifa Ecolodge overlooks the Straits of Gibraltar, with views of Africa. It gets its power and hot water from solar panels and has its own water catchment and purification system. 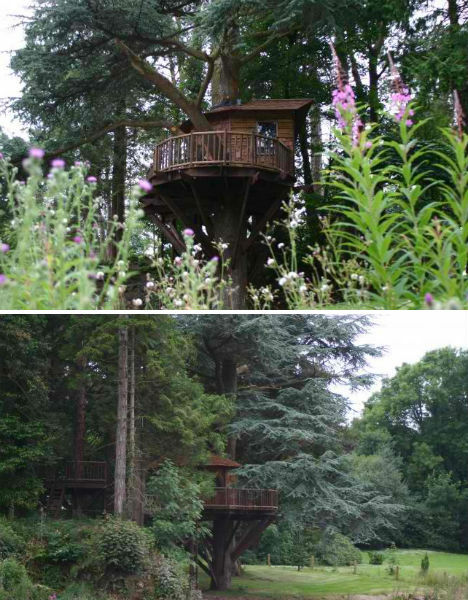 The round Treetop Holiday tree house of Sussex, near the spa town of Royal Tunbridge Wells, is an eco-lodge in the countryside with views of farmland. To access it, you must cross a nearly 80-foot-long rope bridge over a scenic pond. Charming in its organic simplicity, the Longridge Training Center offers water sports and land-based activities for young people. Blue Forest gave this building, which includes kitchens, meeting rooms, a training hall and more, a full range of eco-friendly features like rainwater harvesting, a heat loss recovery system and lots of sustainably sourced wood. Off-kilter windows give this cute treehouse school in Cobham lots of cheer and personality, adding to the uniqueness of the space. 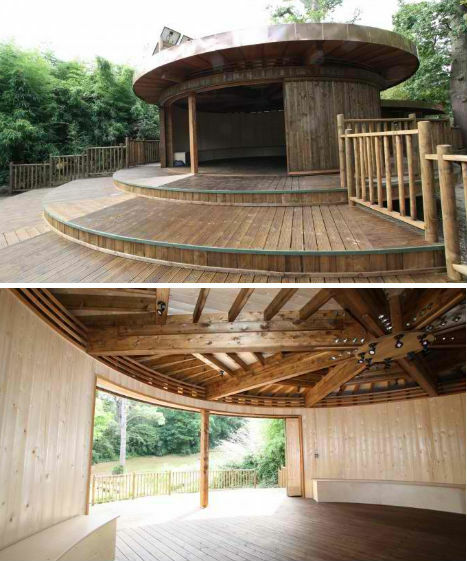 The Feltonfleet Preparatory School added the treehouse as a sustainable way for the school to extend its teaching space. 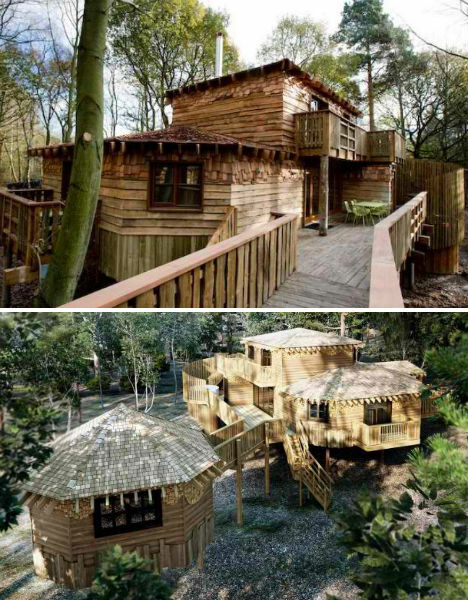 A stunning juxtaposition of rustic and contemporary style, these treehouses for the Center Parcs Sherwood Forest each have four double bedrooms with en-suite bathrooms, open living spaces, kitchens and secondary treehouse ‘entertainment pods’ with home theaters and pool tables. 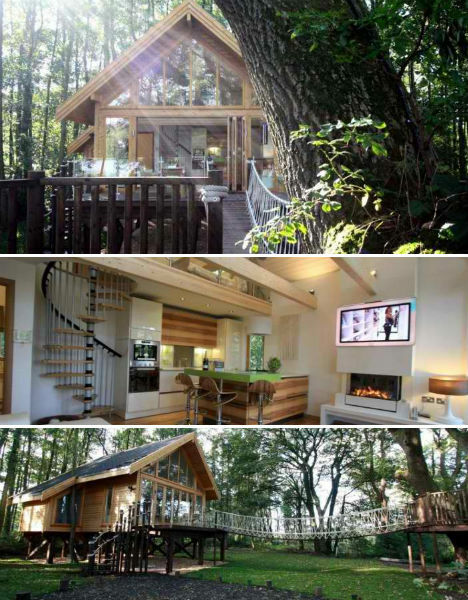 As with all of Blue Forest’s projects, the treehouses are eco-friendly, with lake-source heat pumps, low-energy lighting and grey water recycling. 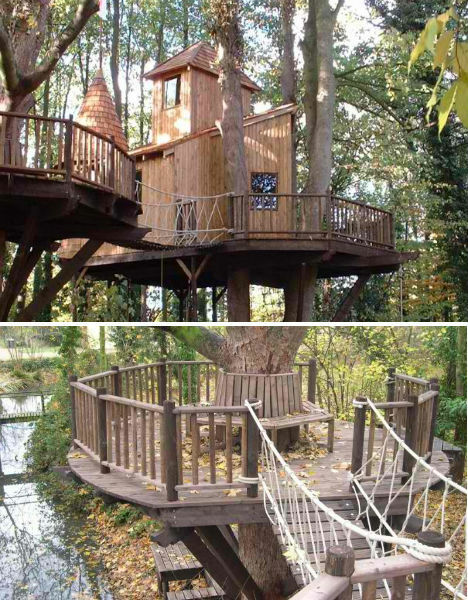 Built along a small river in the Hertordshire countryside, Enchanted Forest is a two-story fantasy play structure for kids. 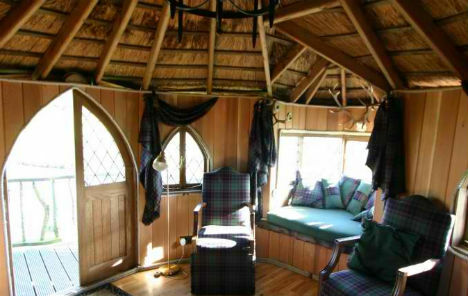 It features a large main room and open turret with a ladder leading up through a ‘secret’ trap door to a hideaway upstairs, and even has a wood-burning stove. 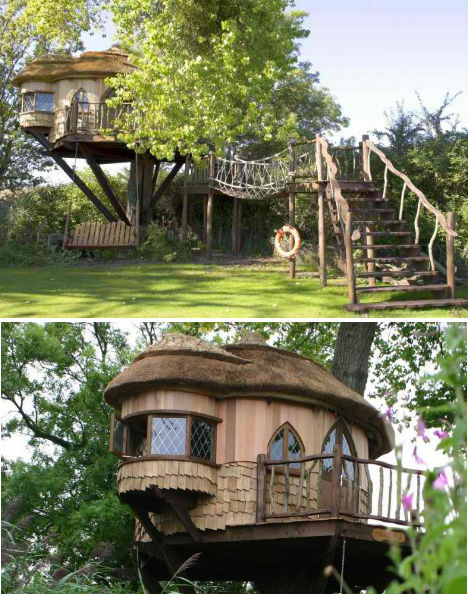 This sprawling treehouse has a main ‘tower’ and several different decks that form a sprawling fantasy play area for kids, incorporating a central trampoline, swings and slides. 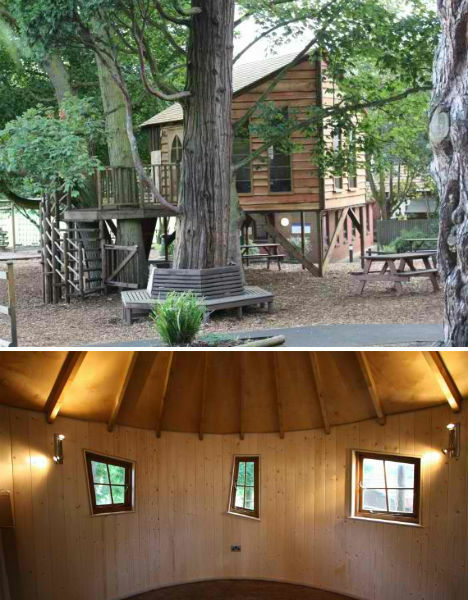 Quirky and fun, Woodland Haven was built around a central tree as an outdoor play area for children and includes a secret trap door, cargo net, fireman’s pole, monkey bars, swings, a slide and even a basket and pulley to lift items up to the treehouse. A swing bridge attaches it to a deck across the yard. 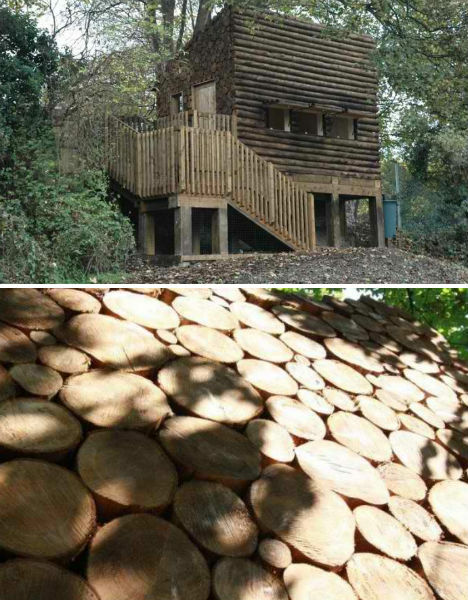 Looking like nothing more than a stack of logs, this structure is actually a small and efficient pre-fabricated classroom. 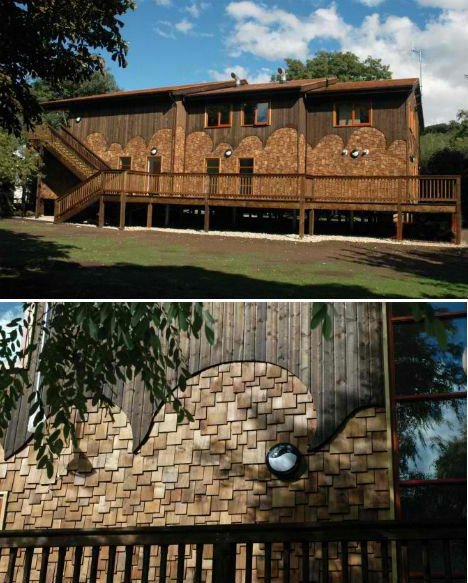 The Fairfield Eco-Classroom is raised nearly 7 feet from the ground and covered in a log facade, which was even applied to the window shutters to complete the illusion when they’re closed. 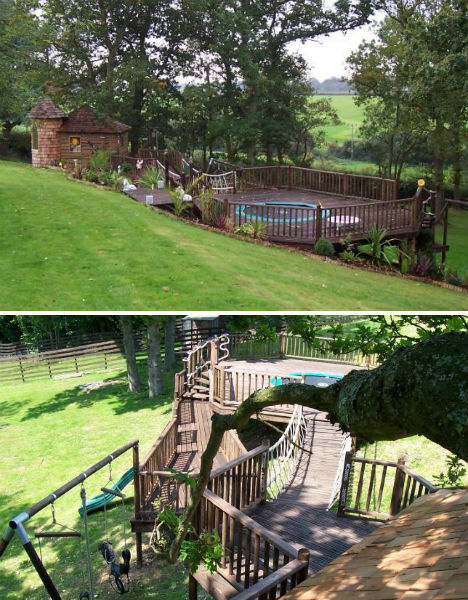 Built about 14 feet off the ground at the edge of a forest in Cumbria, Northwest England, the fittingly named ‘Treetops’ is a rustic treehouse with a secondary drinks deck for adults, connected with a swinging rope bridge. Ringed in copper, this round school building is made of sustainably harvested timber and constructed to blend into its woodland environment. The Benenden School eco classroom is the first building in the UK to process harvested rainwater from its sedum roof into hot and cold drinking water using only solar power. 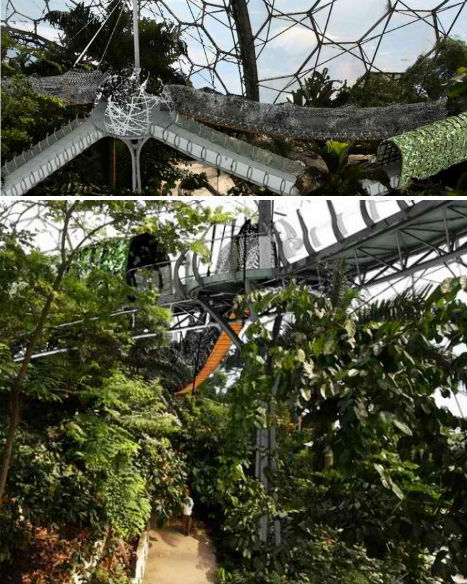 Blue Forest has designed a nearly 500-foot canopy walkway for rainforest education resource The Eden Project in Cornwall. ‘Rainforest Encounter’ will be built within the Rainforest Biome at the center, taking visitors on a journey through the treetops nearly 40 feet above the ground.